Rusonyx Review 2019: Is Rusonyx a Good Hosting? Rusonyx is a web hosting company based in Moscow, Russia that offers shared hosting, virtual servers, domain registration, and test hosting services to the Russian market. Rusonyx was founded in 2001 bringing VPS technology to Russia and has developed technologies that have revolutionized the tech world, like container virtualization. Rusonyx prides itself on having efficient servers which are known to meet the Tier 3+ reliability level in addition to the international standards. Convenience is one of the most attractive features in web hosting and this is exactly what Rusonyx has in store for you. There is a convenient control panel with a main panel as the central place for managing services like bill payments, ticketing support, and other additional services. There’s also a mobile application compatible with Android, iOS, and Blackberry, which lets you monitor the status of your server anywhere and anytime. Dealing with high loads and intensive projects has been made easier with Rusonyx. The incredible thing about this service is that you get a server that is actually ready for work with a very high-quality administration service, instant server activation, and compatibility with 64bit OS. If you’re skeptical about using an untried service, not to worry, you can take advantage of the offer of seven days of free VPS hosting. With the high level of innovation and intellect in the Rusonyx team come very affordable packages, with each package better than the previous and tailored to meet all your hosting needs. Rusonyx also offers well-illustrated payment methods and great promotions to their customers as a way of showing appreciation. The company can be contacted via phone, email, and live chat, with 24/7 support and a listed average response time of 17 minutes. There is also a very informed knowledgebase. It will answer all of your questions and give you the insight you need into the different components of the web hosting services. 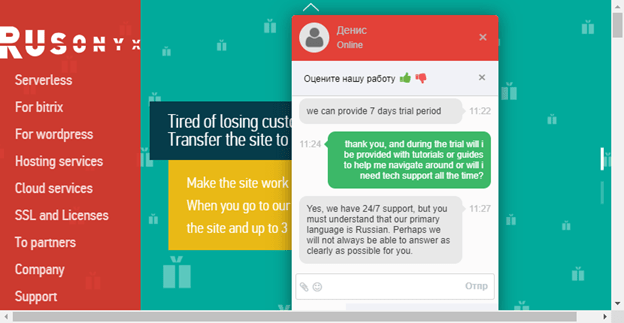 The website and support system are mainly in Russian but you can also get assistance in other languages and their response time is fairly good. Rusonyx has advanced technology with the highest efficiency possible. With web acceleration technology, dedicated web and mail servers, and a webmail interface, this is the place to be if you’re in search of sophisticated web hosting. 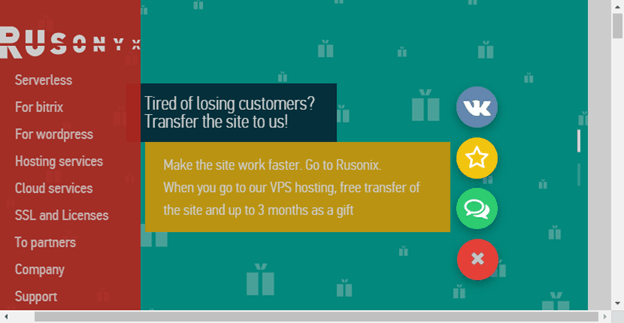 Wondering how Rusonyx stacks up against other Web Hosting companies? Enter any other Web Hosting company and we will give you a side-by-side comparison.